23 May Nutrition, Nutritional Facts, Product Specifications No comments. Nutritionists and dieticians agree that half of one’s plate should be filled with fruits and vegetables. While fresh produce is great, canned and frozen fruits and vegetables have a longer shelf life, are easier to prepare, and are often cheaper than their fresh counterparts. The challenge for many of us and those in foodservice is that if it is not fresh or organic, is it still good for us? Recent research conducted by UC Davis and published in the Journal of Science and Agriculture found there may be more loss of nutrients in fresh produce, whereas freezing and canning may preserve nutrient value. So while we love fresh produce, if eating frozen or canned fruits and vegetables is an easier fit for your lifestyle, go for it. According to the FDA, frozen fruits and vegetables provide the same essential nutrients and health benefits as fresh. Fruits and vegetables chosen for freezing tend to be processed at their peak ripeness and are packed with the most nutrients. On the other hand, fruits and vegetables destined to be shipped to the produce aisles around the country typically are picked before they are ripe. Outward signs of ripening may still occur, but these vegetables and fruits will never have the same nutritive value as if they had been allowed to fully ripen on the vine. Produce to be canned or frozen is processed immediately after harvesting so nutrient losses after picking are minimal. The canning or freezing process may cause some loss of nutrients which can vary by nutrient. Generally, these losses are small and are not substantially different than losses that may occur at home. Depending on the produce item, canning and freezing may actually preserve some of the nutrient value and can even increase the availability of some nutrients to the body. By the time they are consumed, most fresh, frozen, and canned fruits and vegetables seem to be nutritionally similar. Each has the same basic fat, carbohydrate, and protein content as the pre-harvest fruit. While there is variable loss in water and fat-soluble vitamins depending on the post-harvest processing method , for the most part you can feel confident that frozen and canned (without additives) fruits and vegetables are just as good as the fresh stuff. Canning locks in the nutrients at their peak of freshness, and they have a long shelf life and are easy to store. 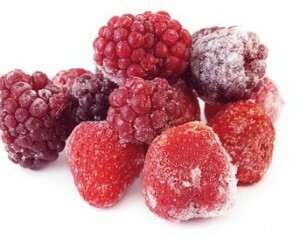 Frozen fruits and vegetables are also packed at their peak of freshness, but do have a shorter storage life than canned. Frozen vegetables should be consumed within 8 months of purchase, and frozen fruits should be used within 12 months of purchase (4-6 months for citrus). Whether canned or frozen, always read the food label and avoid items that have added sugar, such as canned fruit packed in syrup. When possible, choose items packed in water or in their own juices. Also, you choose items that have been processed with the skin of the produce intact to maintain the fiber content. Although canned and frozen fruit and vegetables are a convenient and practical way to up your intake, make sure to include lots of fresh produce as well. Expand your repertoire and enjoy the variety of in-season fruits and vegetables. To maximize the nutrient content of fresh produce, buy from local sources and don’t buy more than you can use within a few days. Avoid produce that is bruised or wilted as nutrient loss has likely occurred. Bottom line, any fruits and vegetables are better than no fruits and vegetables. By increasing the variety of fruits and veggies in the diet, you can add interest to meals and snacks and also take advantage of the nutritional benefits that each form provides. A diet should include a mixture of canned, frozen, dried and 100% juice products. Explore your supermarket or distributor and see what new food experiences await you.